Gede sent me his photos of a tornado in Java in January or February. (Unable to enlarge due to poor resolution of cell phone photo). 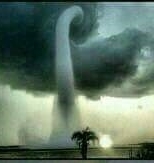 Another of Gede's cellphone photos of the above tornado. A man of the beach collecting miscellaneous items from the beach placing them in this cart attached to his motorbike. Living in Bali is the perfect environment befitting our daily posts. Almost every day, there's something interesting right before our eyes as we lounge outdoors on the veranda, whether ensconced in the chaise lounges or sitting under the cabana. Most days after I've completed posting and Tom has finished the bulk of day's research for future travels, we get comfortable under the shade of the thatched roof cabana, the closest spot to the ocean on the veranda to cool off, dry off from the pool and get out of the sun. Yesterday, rather suddenly the sky became dark while winds raced across the beach. October is Bali's rainiest month. Its rained the first two days of the month thus far. As we've mentioned many times in past posts, we don't spend more than 30 minutes a day in direct sunlight, sufficient for a good dose of vitamin D while providing enough of a tan base to protect us while walking on the beach and in the neighborhood. Neither of us uses sunscreen which we consider to be a toxic slurry of chemicals we'd prefer to avoid. This isn't possible for everyone, especially children, who are too young to be mindful of excess sun exposure. With a massive gust of wind we heard a huge crash of glass next door. While in the pool we both wear baseball hats and sunglasses, keeping our bodies underwater from the neck down. No sunburns are found here! The sun in Bali, so close to the equator, is unbearably hot likely to burn most within 20 to 30 minutes. At our recent resort stay we noticed many tourists with painful looking sunburns. Thus, after the pool and the 30 minutes max in the sun, we head to the comfort and shade of the cabana where I usually read aloud to Tom our current favorite book, most often biographies. Closer view of fallen glass from second story veranda. Having been away from people for so long and not using my voice as frequently as I may have in the past and on cruises, I can only read aloud for about 40 minutes when my voice begins to sound hoarse. I suppose the voice is comparable to any other part of the body...use it or lose it. After putting down my phone (the book is on the Kindle app), we often chat about the book we're reading, future travels and many other topics with our eyes peeled on the beach for possible sightings of interest. Tom's photo when he'd gone next door to see what had happened during the high winds. Yesterday, our first full day back from Lovina, we found ourselves entrenched in this familiar and highly pleasurable routine when suddenly the sky went dark with ominous looking clouds with excessively high winds whipping through the area. In a matter of seconds, we jumped up to head indoors, hearing a ear splitting crash of glass and metal in Egon's house next door. Apparently, as shown in today's photos, the wind was so powerful it broke one of the massive safety glass walls of the upper level veranda with the heavy duty glass crashing to the ground. We have an identical glass wall in the second floor veranda in this villa as well. Only minutes earlier we'd been lounging on the verandas below where this glass would have fallen had it occurred at this house. Whew! Safari luck prevails, once again. This photo illustrates how the blown out thick glass enclosure left an opening where the blinds were blowing in the now open space of the veranda. Luckily, none of the staff at Egon's villa was injured when the glass wall shattered to the ground. Tom, anxious to take photos of the incident, grabbed the camera and hurried next door to take today's shots while I stayed indoors at our villa under cover of safety. I was worried that he was outdoors during the storm anxiously awaiting his return to our villa. With what felt comparable to 60 mph winds almost blowing me over when I was outdoors, Tom took the photos and quickly returned thrilled he'd been able to see what had transpired beyond the vegetation blocking the view from our veranda. Finally, we were both safely indoors while Tom immediately closed the wall of glass doors on the main floor while we hunkered down in the master bedroom where we could easily continue to watch what was happening outdoors. The falling glass was scattered about the patio floor below. Once the storm danger had passed, the staff went to work cleaning it up. The rain didn't fall as violently as we'd expected. In a short time, the worst of the storm had passed leaving a steady stream of rain in its wake. We remained indoors the remainder of the day and evening. Today, it is raining again. After another fabulous dinner prepared by the two Ketut's we meandered to the living room for the evening. Gede had replaced the flat screen TV that was destroyed by the flood after the hot water heater's broken pipe (located on the roof) a few days before we left for Lovina. Not surprisingly, again we had a working TV and sound system we could use with our HDMI cord to watch both Marco Polo and Narcos on Netflix. Great shows, by the way! Recently, Netflix had become available for international use. We jumped all over it signing up for the first month's free service to see if we'd like it. Most likely, we'll continue to service after the trial ends. The blinds blew from the open space during the high winds. We're still using Graboid for recently aired series although the signal in Bali is too weak to download a single episode. With these two services, we can watch most TV series and movies broadcast in the US and the UK. The combined cost for both of these services will be IDR 390,495, US $30 which is almost eight times less than what we paid for premium cable (and internet) in the US. No complaining here. Today, we're on our own with the staff off for the day. As much as we enjoy quiet Sundays to ourselves we never mind the presence of the staff who are with us only part of each of the remaining six days a week. With neither of us caring to eat breakfast or lunch, except when on cruises or at resorts, there's no necessity for them to hang around the villa. They arrive in the morning, prep for the evening's meal, clean the villa and take an afternoon break returning by 4 pm to prepare dinner. Ribud, our kindly landscaping and pool guy, arrives each morning at 8 am, prepares our chaise lounges with fresh towels, cleans the cabana and veranda, cleans the beach in front of the villas and works on the pool and grounds. Tom quickly returned to our villa for safety during the storm. He then stays next door through the remainder of the day, rushing over here in the event of rain to bring in the chaise cushions and towels indoors. If we need him for anything, he's here in a flash. Gede pops in and out every few days to see if there's anything he can provide. Its a perfect scenario ensuring our privacy and fulfilling any desires we may have. We continue to be impressed with the attention to detail and their infinite care. We ask for very little but are given a lot. We hope your day fulfills your needs. One year ago today we posted this favorite photo we'd taken in Fiji. Look at those cute pink ears! We did our own squealing with delight seeing this little white pig. For more details, please click here.